Our team of fitters have recently completed a 350m² underfloor heating and screed project in Bridge of Allan, Stirling. The property is undergoing some extensive alterations and Incognito Heat Co. have been tasked to deliver a brand-new underfloor heating system and a ground source heat pump system to heat the entire property. Due to the scale of the property, two underfloor heating manifolds are necessary, and these have been installed at opposite ends of the building to manage unwanted heat build-up on the approach to each manifold. To maintain the highest standards, Incognito Heat Co. manage each step of the project from floor preparation, design and installation of the underfloor heating pipework, right through to the application and levelling of the liquid floor screed. We believe the only way to achieve a quality result is to invest in quality suppliers and installers. Our screed material of choice is Cemfloor, which is a high performing cement based liquid screed. The product is available through a select number of concrete batching plants who must adhere to the most exacting standards and is installed by our installation team who themselves undergo regular product training. Around twenty-five cubic metres of screed was ordered for this property, to be pumped and levelled in one continuous operation. 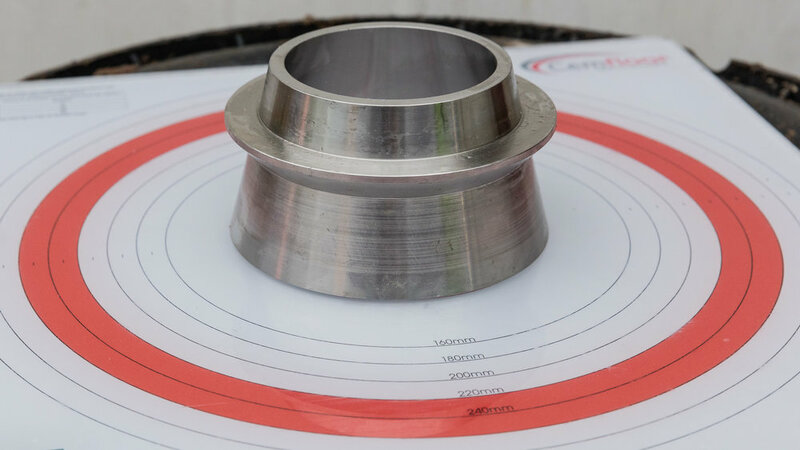 On a project of this scale, a dependable supplier is called for who can ensure that material is always available, and at the correct consistency. For this we turned to our longstanding supply partners, Grange Quarries who have constantly performed, both in terms of reliability in deliveries and the quality of material. Upon arrival, all fresh screed is tested for the correct flow rate. This test allows our lead installer Don to judge whether the material is within tolerances, and can be used immediately, or whether further judicious additions of water are required to bring the material to the looked-for workability. Our team is trained by the manufacturers and will if necessary, reject any material that falls outside the high standards we demand. A successful flow rate test result is always a welcomed outcome on what is always a very busy day. Material is pumped into the building, and being liquid, it encapsulates the heating pipes very well. At this point it is apparent why such care and attention has been expended on the preparation, as a successful pour will often hinge on the standard of workmanship of the team working directly before. Following placement of the material, the screed is worked with dapple bars to finally displace any entrapped air within it. On the last pass the surface of the screed is sprayed with a curing agent which creates a ‘skin’ to prevent excessive water loss which can lead to issues with cracking. Before our team leaves site, we will wash down all our equipment, so it is important that space is set aside for this messy but necessary task. All windows and doors are shut to prevent air movement across the green screed whilst it is in its infancy. Care should be taken to guard against damage from foot traffic and point loading until the screed has gained full strength. Full instructions on the care and maintenance of the new screed are supplied to the builder, so the minimum possible time is spent getting it to a point where floor finishes can be applied.